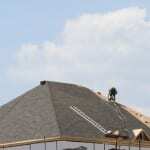 As commercial roofing contractors in the Midland area, we take pride in offering excellent service. When you own or manage a commercial building, you have a lot of tasks on your plate. Worrying about the condition of the roof is the last thing you want to do, especially since you probably don’t have much time to keep track of this aspect of the structure’s exterior. Instead of worrying, contact our experienced commercial roofing contractors at Slippery Slope Roofing. As commercial roofing contractors in the Midland, Ontario area, we take pride in offering excellent service and high-quality work that will protect your building and keep it in good shape throughout the changing seasons. The roof on your commercial building serves a very important purpose. With a leaky or damaged roof, you could notice moisture seeping through the materials, which can cause significant damage to the interior. In a commercial setting, this is especially concerning because you might have inventory, equipment, computers, and other important items that could be destroyed beyond repair. Too much moisture can also lead to mold growth, which can make people within the space feel sick. Our commercial roofing contractors can assess the current condition of your building’s roof and keep an eye on any potential issues, which can reduce the risk of these concerning issues. If we find damaged sections, we can perform repairs or replacement services to make sure your roof can withstand the climate shifts outside while offering the level of protection you need. Contact us today to find out how our commercial roofing contractors can help take on this task for your commercial building.